Signs of spring have been popping up the last few weeks. The sunshine, warming temperatures – even a short morning drizzle all have me daydreaming of the many miles of hiking and backpacking that lie ahead this year. I cannot wait to get my boots muddy! As an avid hiker and backpacker, I have had my fair share of issues while exploring the natural world: flooded creeks swallowing the trail, injury and even becoming lost. I have learned that I cannot plan ahead and prepare for every situation, but I can stay found while in the wilderness. Here are my top tips to help you not get lost in the woods and what to do if you ever find yourself in such a situation. Stick to the trail. This is the easiest way to stay found (and minimize our impact on the environment). If you have never stepped off a trail to camp or go to the bathroom, the thick underbrush can be disorienting, clouding your path back. Too often I have heard stories of a hiker becoming lost and later found deceased just a few hundred feet from the trail. Let someone know where you are going and when they can expect you to return. This is like your wing-person who will bail you out of a bad situation. Their job is to notify the proper authorities if you have not contacted them by the agreed upon time. Familiarize yourself with the area. If you contact the landowner or visit their website ahead of time, you will learn if there is a trail closure or important information about the area conditions (e.g. lots of blowdowns, bears in the area, drinking water status, etc.). This information will help you stick to the plan you left with your wing-person and ensure you can stay found if you do become lost. Bring a map and compass and know how to use them. You can do all the research in the world and still experience something unexpected while hiking or backpacking. 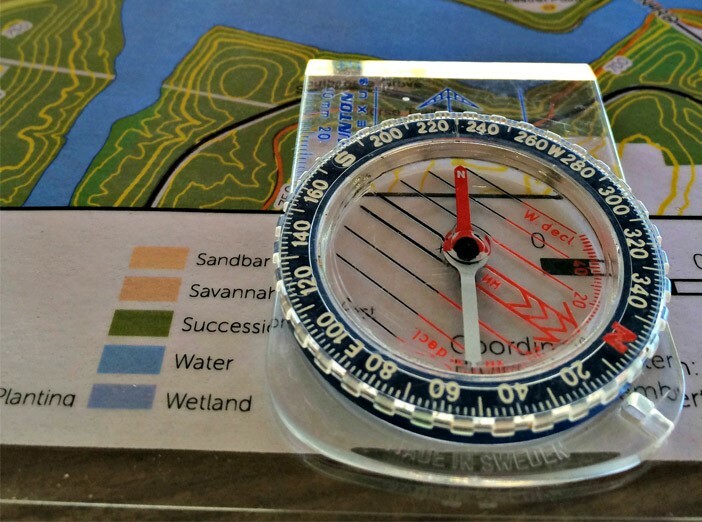 Knowing how to use a compass and read a topographical map will be a lifesaving asset if you do become lost or have to make an emergency exit from your planned route. Develop your skills. Continued learning allows for a more enjoyable experience while exploring the great outdoors. Head to the Adventure Outpost page to learn more about all of our program offerings.